Christopher Radko Glass Red Splendor Santa Claus Christmas Ornament #1017094. The Christopher Radko Company has been designing and producing fine European mouth-blown glass ornaments for more than a quarter of a century Ornaments are produced in Europe by a seasoned team of artists and craftsmen, many of whom have been with the company since its very inception. Each piece is meticulously crafted by hand, using Renaissance-era carving, molding, glass blowing, silver lining, hand painting and finishing processes that require both unparalleled skill and several weeks to complete Exquisite workmanship and handcrafted details are the hallmark of all Christopher Radko creations. Bring warmth, color and sparkle into your home as you celebrate life’s heartfelt connections. More than just an ornament, a Christopher Radko ornament is a work of heart! 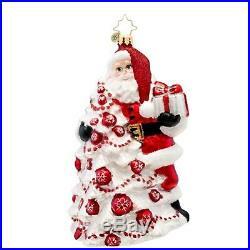 Features a beautiful winter white Christmas tree decorated with red balls and garland, and Santa standing next to it, holding a matching gift Comes ready-to-hang with a gold hang tag and charm Ornament comes gift boxed Dimensions: 7″H x 4″W x 3D Material(s): glass/metal. Package Dimensions: 9.6 x 5.2 x 5.1 inches. Item Weight: 9 ounces. Have peace of mind knowing that your order will arrive original factory sealed packaging. You’re already purchasing the item. That means having access to real people that get your questions and concerns answered quickly. Give us a shot and we will make sure that you will look to us again! The item “Christopher Radko Glass Red Splendor Santa Claus Christmas Ornament #1017094″ is in sale since Monday, February 26, 2018. This item is in the category “Collectibles\Decorative Collectibles\Decorative Collectible Brands\Christopher Radko”. The seller is “jcwv50″ and is located in US. This item can be shipped to United States.